Based on the material presented in Chap. 4, there are a few observations about logic design that are apparent. First, the size of logic circuitry can scale quickly to the point where it is difficult to design by hand. Second, the process of moving from a high-level description of how a circuit works (e.g., a truth table) to a form that is ready to be implemented with real circuitry (e.g., a minimized logic diagram) is straightforward and well-defined. Both of these observations motivate the use of computer-aided design (CAD) tools to accomplish logic design. This chapter introduces hardware description languages (HDLs) as a means to describe digital circuitry using a text-based language. HDLs provide a means to describe large digital systems without the need for schematics, which can become impractical in very large designs. HDLs have evolved to support logic simulation at different levels of abstraction. This provides designers the ability to begin designing and verifying functionality of large systems at a high level of abstraction and postpone the details of the circuit implementation until later in the design cycle. This enables a top-down design approach that is scalable across different logic families. HDLs have also evolved to support automated synthesis, which allows the CAD tools to take a functional description of a system (e.g., a truth table) and automatically create the gate-level circuitry to be implemented in real hardware. This allows designers to focus their attention on designing the behavior of a system and not spend as much time performing the formal logic synthesis steps that were presented in Chap. 4. The intent of this chapter is to introduce HDLs and their use in the modern digital design flow. 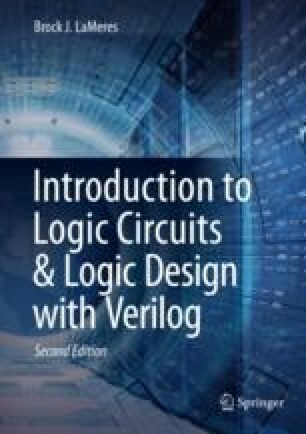 This chapter will cover the basics of designing combinational logic in an HDL and also hierarchical design. The more advanced concepts of HDLs such as sequential logic design, high-level abstraction, and test benches are covered later so that the reader can get started quickly using HDLs to gain experience with the languages and design flow.